After the indy referendum in September 2014 we No voters – who were startled to find we’d been given a new identity, Unionists or Nawbags – thought we could forget about that interruption and get back to normality. Wrong. The SNP rode high, grabbed 56/59 (95%) of the Westminster seats in the general election and are likely to take as many in next year’s Holyrood election. Their opposition is fragmented into the old parties of Liberal Democrat, Labour and Conservative, Labour has been broken and the only party that has gained are the Conservatives as the full-out Unionist party under the gutsy Ruth Davidson. So it’s been a gloomy time for us Negative lot, with constant threats of more referenda being waved at us in spite of the once in a generation, once in a life time, One Opportunity rhetoric during the indyref. One Snat tried to convince me that One Opportunity really meant An Opportunity. Meanwhile Sturgeon swans about doing photoshoots for Vogue – though credit where it’s due – she shows a good deal of bright style in her clothing in contrast to the grey frumpy Noes. “Bitter together” describes our mood. But now something has happened to lift our spirits with schadenfreude. 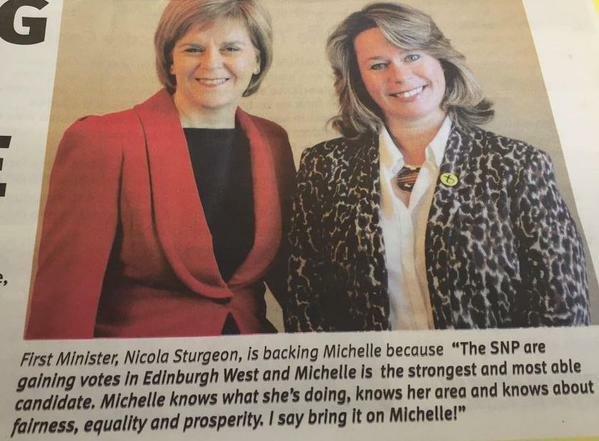 It concerns the MP for Edinburgh West, my MP, Michelle Thomson. As I said before Thomson headed up Business for Scotland, a group which encapsulates the sham of Scottish politics because it is (a) an SNP front – as demonstrated by Thomson being given the Edinburgh West seat; (b) it was called Business for Scotland – and of course other (subtext and overt ) anti-indy businesses must be against Scotland; (c) it was a load of mickey-mouse consultancies, who employed few people and did little in the way of cross border trade with England. But it was treated like the CBI by the BBC. Thomson was elected in the SNP landslide and made Shadow Minister for Business, Innovation & Skills. Business eh? Not software design, nor extracting oil nor wind turbine manufacture nor pharmaceuticals nor widgets nor sausages. No, the business spokesperson that the SNP appointed was a woman of property with a portfolio. i.e. a wheeler dealer. Not even a builder of houses. And she had wheeled and dealed – eg (allegation at this point) that she would buy a property at X grand one day and then flog it off the same day at 2X grand to her husband. . The Sunday Times ran an article [paywall] on 20th September about Michelle Thomson’s company buying properties from people like cancer sufferers cheap and then selling them on for a good profit. Nasty, but not illegal. “there was something in that initial article that seemed to the informed eye a bit more sinister. That was the suggestion that, in some of the transactions involved, the price actually paid by Thomson was less than that declared to the Land Registry. “That looks very like mortgage fraud”. Thomson had figured as a “Mrs A” in the Scottish Solicitors Discipline Tribunal which had struck off her solicitor Christopher Hales. On behalf of Mrs A aka Michelle Thomson. After a hearing in May 2014, the Scottish Solicitors’ Disciplinary Tribunal said Mr Hales failed to provide mortgage companies with key information used to prevent fraud and must have been aware that there was a possibility he was facilitating mortgage fraud, whether or not it occurred. In some cases, loans obtained for the properties were greater than the actual purchase price. The Law Society, the regulating body of Scottish solicitors, did not send this information to the Crown Office until July 2015, after both the referendum and the general election. They claimed “pressure of work” (which Scottish lawyers observe they never accept as an excuse from solicitors who have not renewed their membership of the Law Society). The Law Society’s chief executive, Lorna Jack, took the unusual step of arranging a hurried press conference to defend her organisation’s handling of the affair, and the conduct of Sheila Kirkwood, who is secretary to the society guarantee fund sub-committee which handled the Hales case but had delayed handing the papers over to the Crown Office. It emerged that Kirkwood was, with her husband and fellow solicitor Paul Kirkwood, a founder of the pro-independence campaign Lawyers for Yes, and as an active nationalist had attended dinners for Thomson’s pro-independence campaign Business for Scotland. Kirkwood had also “liked” Thomson on her Facebook page. THERE was a rumbling, gutteral soundtrack to much of FMQs today, as Nat MSPs desperately tried to drown out a series of questions about Michelle Thomson. “Uurgrhnomorenomore,” went appalled groans when the dreaded name was uttered. “Nananeverheardofher,” went a lip-smacking simian chatter as fingers were plugged in ears. But despite these best efforts, the property-whizz-turned-SNP-nightmare dominated proceedings, with Labour and the Tories revelling in all the sleazy details. SNP Social Justice Secretary Alex Neil, whose portfolio includes welfare, affordable housing and other issues crucial to the poorest in society, claimed she would be a champion for such causes. Both SNP Education Secretary Angela Constance and Culture Secretary Fiona Hyslop stressed her business background would make her an ideal candidate. Michelle Thomson has resigned the SNP whip and is now my independent MP. Her entry on the SNP site reads like this. The police are investigating her solicitor. It could be that she will be investigated herself and charged, which should lead to an interesting by-election. Sturgeon has said she looks forward to reinstating her but now the Sunday Herald, which supports indy, is going to release emails which show that it was Thomson’s fault that Business for Scotland made such a bad economic case for independence (rather than that there wasn’t a good economic case, as we Nawbag quislings were abused for pointing out). Business for Scotland’s predictions of untold wealth for an indy Scotland are still quoted by disgruntled Yesses, so at least they may shut up on that score. And Thomson will be dumped altogether by the ever ruthless and opportunistic SNP. Update:– the article in the Sunday Herald did not show that “the economic case for independence was undermined by scandal-hit MP” as the headline has it. What it shows is that there was in-fighting among the board members of Business for Scotland. The most salient points are:- Thomson, the Managing Director of Business for Scotland, had her consultancy payments stopped but was allowed to keep the title and still appear on the media – it would have looked bad to dump her before the referendum; and that the controlling hand behind Business for Scotland was Peter Murrell, the SNP chief executive, also Nicola Sturgeon’s husband, which should finally destroy BfS’s pretence of being a non-partisan think tank. I can see that Thomson with her media presence might have been thought suitable as a candidate for Edinburgh West, which she won as part of the SNP landslide. But why appoint her as Shadow Minister for Business, Skills and Innovation and boost her business expertise? Are they short of talent among the 56 55 MPs?